have to PAY the blog for this. Now, let’s get one thing straight; of course there are times when you will have to pay people to do things for your band. But getting an article written about you in a blog ISN’T one of them. Blogs like this one can and do make money from advertising. Not very much money unless it is a very successful blog, but nevertheless it is possible to make a living doing websites, in the same way as it is possible by writing and making music. Huge websites like Facebook, Google, and Twitter make a huge amount of money, same as huge music stars. While smaller sites like GUBIC, or French 4 Tots (another one of mine) make a lot less money, just like smaller bands. In other words we are all in this together, and when I say that, I don’t mean it the way our government does. I mean I am rowing and bailing for my life as well. They claim that their purpose is promoting underground artists, and that the blog is not for profit. 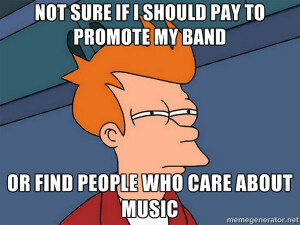 The money they make goes towards putting on local live music gigs. 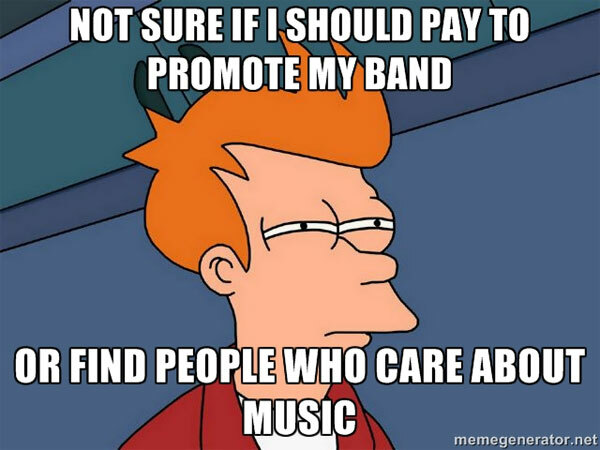 I mean, presumably the money they make putting on bands goes towards ….. ? The interviews are done online. They do practically no work for what is basically a free article for their blog, AND they want you to pay for the privilege. I am so angry I could spit. I would offer to pay 50p per interview if it wasn’t such an insulting amount of money. Cafe of the Muse is a general arts blog, that has a pretty high level of traffic.